A rural Cresco native, Norman Borlaug is debatably one of the most influential people of the 20th century. The father of the “Green Revolution,” he developed a disease-resistant, high-yield variety of dwarf wheat in an effort to fight world hunger. He is one of only five people in history to have won a specific trio of honors: the Nobel Peace Prize (1970), the Presidential Medal of Freedom (1977), and the Congressional Gold Medal (2007). The other four? Martin Luther King, Jr., Mother Teresa, Elie Wiesel, and Nelson Mandela. But despite the numerous accolades, Borlaug somehow manages to maintain his simple Iowa demeanor. Born in 1914, Borlaug grew up like many other boys at that time: he worked the field with his father and planned to attend his one-room schoolhouse until eighth grade, then get back to the family farm indefinitely. But it was a time filled with innovation and determination, and enough people saw a spark in Borlaug that they encouraged him to imagine another direction, starting with high school. Education, Borlaug’s Norwegian grandfather Nels said, was key. The stars were in Borlaug’s sights all the while. Through a Depression-era program called the National Youth Administration, Borlaug was fortunate enough to be able to attend college at the University of Minnesota. He graduated with a degree in forestry, years of wrestling under his belt (he even helped introduce the sport to Minnesota high schools), and an interest in food crops and plant breeding. His forest service job was cut after just a couple of years, so Borlaug headed back to the U of M to study plant pathology. He received a Master of Science in 1939 and a Doctorate in 1942. After two years as a microbiologist on the staff of the du Pont de Nemours Foundation in Delaware, Borlaug accepted a position in rural Mexico organizing and directing the Cooperative Wheat Research and Production Program. Over the next two decades he developed his best-known achievement: a strain of dwarf wheat that tripled grain production there. This eventually led to the “Green Revolution,” the development of high-yielding crops in conjunction with technologies like hybrids, fertilizers, and pesticides. He worked in the fields as much as possible, right alongside Mexican farmers the research was to benefit. Some new varieties of grains produced yields two to four times that of traditional strains, shortened the time required for growth, and produced a plant that could handle diseases and extreme climates. The Green Revolution spread across the world. With help from the Rockefeller and Ford Foundations and additional government agencies, funding was increased, and in 1963 the Mexico research institution called The International Maize and Wheat Improvement Center was founded. The resulting research benefited millions worldwide. Starting in India and Pakistan, the revolution continued on to Southeast Asia, China and beyond. It was “a temporary success in man’s war against hunger and deprivation,” Borlaug has said, not an answer to the real problem. It would merely allow more time to figure out a long-term solution. Borlaug, who passed away September 12, 2009, had put enough work in for five men’s lifetimes by the mid 1980s. 70 years old, he was semi-retired and ready to take it a little easier. But Japanese businessman and philanthropist Ryoichi Sasakawa had other plans. Why wasn’t anyone doing anything about all the starving people in Africa? After decades of research and fieldwork, Borlaug thought he was “too old” to go to a place like Africa to continue the battle against world hunger. To that Sasakawa responded: “I’m 15 years older than you. We should have started yesterday.” Although Sasakawa has since passed away, his and Borlaug’s work continues in Africa. Hunger is not something Borlaug will ever consider beaten, at least not in his lifetime. Borlaug is and was so entrenched in advancing efforts to challenge poverty and world hunger that after winning the Nobel Peace Prize, with the help of Carleton Smith and General Food Corporation, he created a new award to recognize exceptional achievement in agriculture: the World Food Prize. Gifted at the annual Laureate Award Ceremony, the $250,000 prize is now endowed by philanthropist, businessman, and fellow Iowan John Ruan. Ruan “saved” the prize from defunct status in 1989 when General Foods withdrew its sponsorship. He moved headquarters to Des Moines, Iowa, and put together a foundation with a bi-partisan Council of Advisors including names such as former Philippine President Corazon Aquino; former U.S. Presidents Jimmy Carter and George Bush; and H.E. Joaquim Chissano, former President of Mozambique. Chairman until 2003, Ruan supported the prize because he feels a second Green Revolution is necessary to prevent the possibility of future food crises. Today his son, John Ruan III, serves as chairman. The Prize recipients, hailing from locations all over the world, have contributed a range of research and advancements in agriculture and the fight against global hunger. The World Food Prize also holds an International Symposium and a Global Youth Institute each October – this year it will run from October 14 through 16 and the focus is “Food, Agriculture, and National Security in a Globalized World.” Recently renamed “The Borlaug Dialogue,” the symposium fosters a discussion on world hunger and related issues. It brings more than 700 people from 60-plus countries to Des Moines each fall for what organizers call “the most significant observance of World Food Day anywhere around the globe.” They talk about topics like the threat of agro-terrorism, the impending global water crisis, the worldwide challenges of obesity and malnutrition, and the impact of biofuels. There is, of course, a flip side to the coin, and to tell you the truth, food and population are pretty darn political. First there are the age-old Malthusian Theorists who believe population overgrowth will perpetually get “righted” by famine and epidemics. In 1798, Thoman Malthus published “An Essay on the Principle of Population” describing his theory. He made two main points that supposedly proved his assessment: “First, that food is necessary to the existence of man. Secondly, that the passion between the sexes is necessary and will remain nearly in its present state… I say, that the power of population is indefinitely greater than the power in the earth to produce subsistence for man.” Basically, our population would outgrow our resources and widespread mortality was a necessary evil. Whether this is a good or bad thing is highly debated. But what could Borlaug do? Just let a nation starve? Next, there are, of course, problems with the Green Revolution that – like so many things – are clearly viewed in hindsight. In the 80s Borlaug was met by a borage of criticism: pesticides, it seemed, were a probable cause of cancer, fertilizer was far from the natural, organic way that was taking the Western world by storm, and irrigation systems were expensive, impractical, and damaging to the land of these developing countries the new technologies were supposedly benefiting. And while Borlaug has been known to admit that some of these things, specifically pesticides, could be harmful, it never trumps the immediate need to eat. This statement is hard for the wave of organic-lovers to swallow, no pun intended. Ironically, the term “green” today refers to organic, sustainable, eco-friendly habits (when it has long been used to refer to cash). My own clean plate last night consisted of a frittata with local eggs, a salad with greens from our CSA (Community Supported Agriculture), and grass-fed bacon from our friends’ organic farm, Grass Run Farm. And it was good. Plus we enjoy supporting our neighbors and feel healthier, personally, when we eat organic and local food. With the population estimated to lurch upwards of 9 billion by 2030, scientists are predicting the need for another Green Revolution to meet the requirements this will produce: reportedly double the current food production. Organic, Borlaug says, is simply not practical for everyone. But just maybe this new green revolution could be a hybrid itself. Perhaps there is room in the world to both feed the hungry and educate them on population control and healthy farming practices. We need to find solutions to get us to the next moment and solutions to get us to the next generation. The goal: Staying alive while also having a good quality of life. But no matter what, there needs to be something in the bellies of the world’s people. “Of history, one thing is certain: Civilization as we know it could not have evolved, nor can it survive, without an adequate food supply,” Borlaug writes. No one would have thought that one man could feed a billion people, so who knows what the next generation of thinkers, scientists and farmers will bring. A Borlaug of the new era? In an Iowa Public Television program, the determined father of the Green Revolution encourages the masses to try. Aryn Henning Nichols learned a lot about food and farming in the research of this story. It honestly made her head hurt more than a little bit, and led to many an interesting conversation/debate in the Inspire(d) headquarters kitchen. Sculpture artist Kelly Ludeking loves metal. Pretty much all kinds of it. And while he originally started with bronze and aluminum, it was an iron pour that really pulled him in. For Kelly, pouring iron is about community. It’s about learning and teaching, and it was this aspect that really sealed his path and passion. Born in Decorah, Iowa, Kelly attended the local high school, and like many small town teens, was involved in essentially every extracurricular activity that he had any interest in. Mostly art-related things: band, drama, painting, sculpture, etc. “It kind of amazed me to look back and see how much art I dabbled in to find my niche,” he says. That niche was eventually found at the Minnesota College of Art and Design where he was studying metal work. Kelly and some friends were invited to an iron pour – their first – and they watched as nearly a dozen people worked together as a team to feed a fire, melt iron, and pour it into molds to make each person’s individual art works. After, Kelly and friends went back to their college, inspired. They wanted to build their own furnace. And with help from the school, they did. 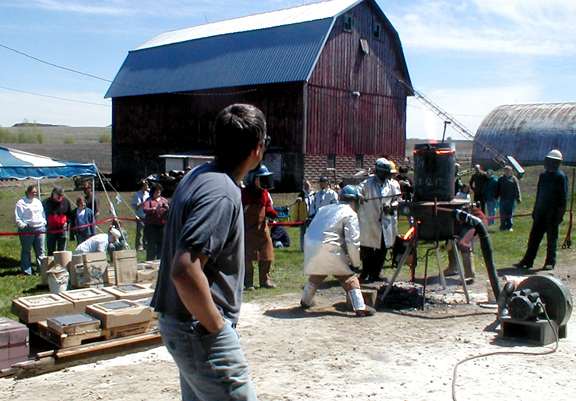 Amazingly, they hosted their very own iron pour later that year. That furnace lived on at the Minnesota College of Art and Design for several years until it was donated to a sculpture park. It’s still used today, and in fact, was recently done so by Kelly. There are a lot of inventive ways to cast post-graduation, he says. One is to set up your own event, like the sixth annual Down on the Farm Iron Pour Kelly hosted on his family’s farm this past July. The whole thing started on a whim – after organizing more than a decade of pours elsewhere, Kelly was living in Decorah helping his family and decided to bring an event here. 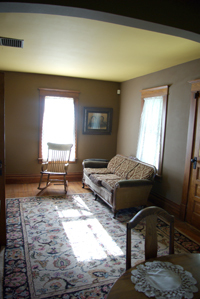 People of all experience levels will stay in rural Decorah out at the Ron Ludeking farm and cast and teach and learn from each other. They come here from a variety of locales –Kentucky, Minnesota, Wisconsin – for this “Down on the Farm” pour. Artists are beginning to look forward to the annual event, even recognizing the barn in the promo posters before they even know Kelly. The entire four-day event is organized by Kelly’s company, Ironhead Sculptural Services, and is open to the public each day from noon until 7 pm. Visitors can come watch artists in the process of creating patterns and molds. Then on Saturday, June 27, at roughly 5 pm, Kelly and his crew of artists fired up the furnace and poured molten metal into the molds they’d been working on throughout the event. After, DJ Efraim Santiago from White Bear Lake, Minnesota, fired up the tunes and mixed music for the annual iron pour party. 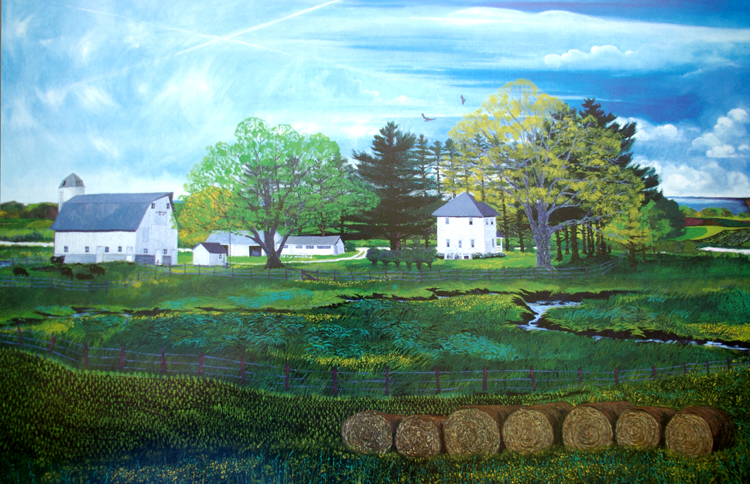 Kelly also taught classes at the farm June 24 through Decorah’s ArtHaus. If things go as Kelly hopes, the entire Down on the Farm Iron Pour will really be one big learning process. 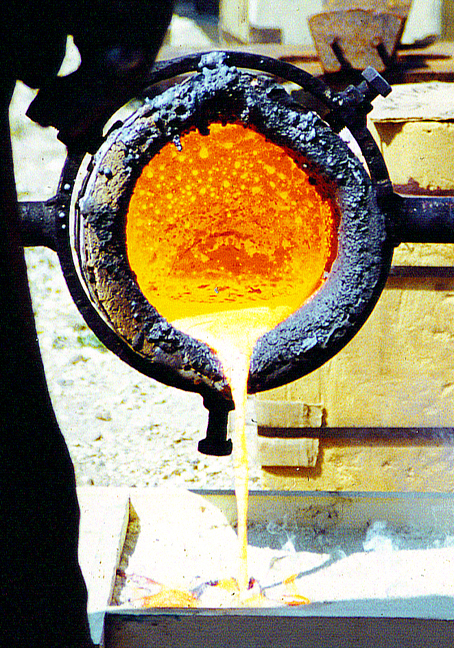 Casting iron for fun and for an art didn’t start until the 60s, Kelly says, and a lot of the original “old dogs” are retiring from pouring and moving on. Aryn Henning Nichols thinks molten metal is pretty darn neat. She hopes lots of people visit Kelly’s cool pour.